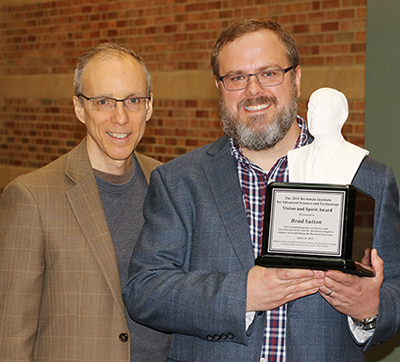 On the anniversary of Arnold Beckman’s birth, Brad Sutton, a professor of bioengineering, the technical director of the Biomedical Imaging Center at the Beckman Institute, and a faculty member of the Carle Illinois College of Medicine, was awarded the 2018 Beckman Institute for Advanced Science and Technology Vision and Spirit Award. The award, in the amount of $150,000, recognizes a researcher at the Beckman Institute who exemplifies founder Arnold Beckman’s vision of excellence, interdisciplinarity, and collaboration. Beckman and his wife, Mabel, contributed $40 million to the institute, which opened in 1989. Jeff Moore (left), director of the Beckman Institute, poses with Brad Sutton, a professor of bioengineering and the technical director of the Biomedical Imaging Center at the Beckman Institute, who was awarded the 2018 Beckman Institute for Advanced Science and Technology Vision and Spirit Award. Sutton’s research focuses on improving the physiological information available from magnetic resonance imaging (MRI) through the development of integrated pulse sequence and image reconstruction methods. His technological achievements have been a core part of the Beckman Institute’s work in cognitive aging; his algorithms are key to quantitatively assess brain structure and function along with its age-related changes. He also has been instrumental in developing techniques to evaluate brain elasticity (MR elastography) and neuromuscular coupling in the speech and swallowing system. “Brad epitomizes what it means to be a Beckman Institute researcher,” said Jeff Moore, the director of the Beckman Institute. “He has established an active and meaningful relationship with Carle that exemplifies the benefits and impact that occur when Illinois' researchers learn what is relevant, important, and challenging to Carle physicians while they, in turn, gain from experiences and expertise that we have. “It’s great to get an award based on collaboration because I can’t take credit for it,” Sutton said in remarks at the reception. “It’s really about the people here that I work with on a daily basis. People who have the dream with you and then actually expect those dreams to come true … who could ask for more? Sutton earned a Ph.D. in biomedical engineering and an M.S. in biomedical and electrical engineering from the University of Michigan, Ann Arbor, in 2003. He earned a bachelor’s in general engineering from the University of Illinois at Urbana-Champaign. He returned to the U of I in 2006 as a faculty member in the Department of Bioengineering and is a Bliss Faculty Scholar. He is an affiliate of the departments of Electrical and Computer Engineering, Speech and Hearing Sciences, and of the Neuroscience Program. The Beckman Institute for Advanced Science and Technology is an interdisciplinary research institute that was created as a way to bridge divisions between engineering and physical sciences and the life and behavioral sciences. More than $400M in research grants have funded projects at the Beckman Institute since 1992.